November 4 is also one of my favorites: Use Your Common Sense Day! Check out last year’s post here. On November 4, 1922, British archaeologist and Egyptologist Howard Carter made one of the biggest archaeological discoveries of the century. Lord Carnarvon had funded several years worth of digs with very little in the way of results, but he decided to give Carter one more year. Then, they uncovered Pharaoh Tutankhamen’s tomb! King Tut is really not the most exciting of Egyptian pharaohs. He became king circa 1332 BC at age nine or ten, and died a mere ten years later, probably of natural causes. Nevertheless, his tomb is remarkable. Most tombs were raided for valuables repeatedly over the years, and, unsurprisingly, there’s been some decay in the intervening 2300 years. 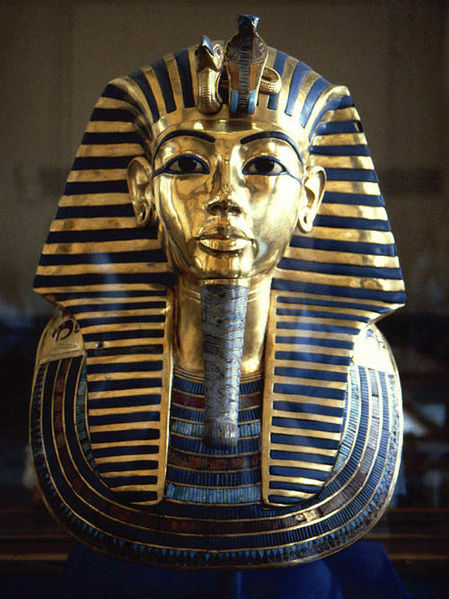 Tut’s tomb was robbed at some point, but the thieves primarily took perishables such as oils and perfumes, probably within a few months of burial. Then the tomb was forgotten, lost underneath stone chips and sand, left alone for centuries, until Carter, Carnarvon, and others peered through a crack by the light of a candle and saw gold reflecting back. To celebrate, read more about King Tutankhamen and see lots of amazing pictures at kingtut.org. Or you can just start walking like an Egyptian! This entry was posted in Uncategorized and tagged King Tut Day, November 2013. Bookmark the permalink.